Our range of New Zealand Made all natural products looks after the skin and coats of horses around the world and; whitens whites and leaves a show quality shine. We only use the finest natural ingredients so you won't find any synthetic nasties like parabens, sulfates, synthetic fragrances or colors in our carefully crafted range. Our ingredients are spray-free, wild harvested or organic and all our products are cruelty free. Here at WashBar beingsustainable and ethical aren't just trendy terms.To us, they're a way of life. Gentle & Soothing - Perfect for regular washing but gentle enough to use on a variety of skin conditions. Ideal for soothing sensitive, irritated or itchy skin. Naturally Relaxes Your Horse - Lemon Myrtle Pure Essential Oil is a natural calmer, making it ideal for horses who find bath time stressful. Economical To Use, Saving You Money - One bar is equivalent to over 34 fl oz of liquid shampoo and there's no plastic bottle or packaging to dispose of since our soap bars come in 100% biodegradable unbleached kraft boxes. 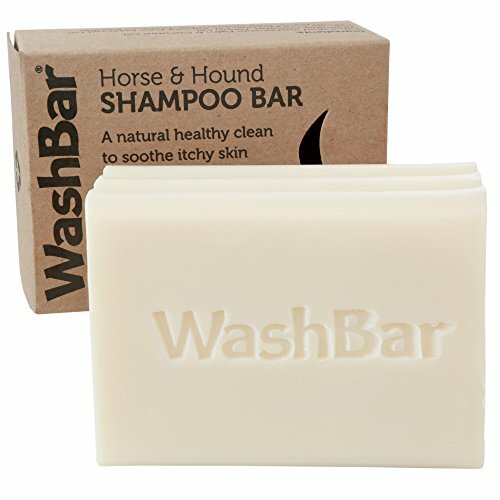 Frees Up A Hand, Making Horse Washing Much Easier - Washing a horse is so much easier with a bar of soap. It frees up one hand to sooth your horse, and it's easier to wash the underside of your horse - gravity isn't working against you. 1. Wet your horse thoroughly and either rub the bar directly onto their coat or lather up into a sponge and rub in. 2. Work the soap in with a good massage - being washed should be enjoyable. 3. Rinse off thoroughly with clean water. EASY TO USE - don't fight gravity and lose liquid shampoo onto the ground. So much easier to use a bar of soap for those difficult to reach places. Great for a quick wash on mane and tail. Naturally no nasty chemicals that you wouldn't put on your own body. HEALS AND REPAIRS - heals mud fever, scald, and heat rash as well as eczema and other fungal conditions leaving the coat beautifully clean and healthy. SO ECONOMICAL - one bar lasts longer than 34oz of liquid shampoo. And no more leaking liquid inside your tack bag. 100% NATURAL INGREDIENTS - the natural active ingredients are anti-allergy, anti-fungal, & anti-inflammatory. Key active ingredients are Neem oil, Manuka, Kanuka and Lemon Myrtle. If you have any questions about this product by WashBar, contact us by completing and submitting the form below. If you are looking for a specif part number, please include it with your message.